The Con-Dem government eager to implement a hit list of spending cuts that primarily target Labour area's of the country have started the ball rolling with £2 billion of cuts in planned projects which range from a new £450 million front line NHS hospital to an £80 million loan to Sheffield ForgeMasters that would have been the genesis for the development of a nuclear power industry in the cities steel sector. The Liberal Democrats were smarting from having lost ground to Labour in the general election in Sheffield as they lost overall control of the city, as well as failing to gain the Sheffield Central seat, which made the scrapping of the loan to Forgemasters an easy option for the Liberal Democrats to announce. 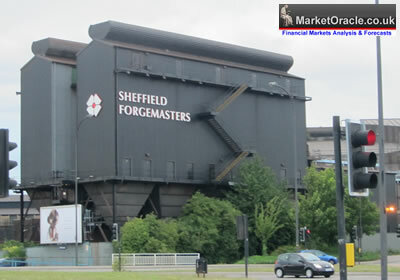 Whilst the Con-Dem government's propaganda machine announced that the £80 million saved will go towards bridging the gap in the countries finances, however what the Liberal Democrats down played was that the monies would have been an interest bearing loan to Sheffield Forgemasters that would have been matched by private sector support of several hundreds of millions more so as to kick start the nuclear industry in the city as ForgeMasters installed new plant machinery to enable it to produce nuclear power plant components that would eventually have lead to the creation of several thousand high skilled jobs. Now all those future jobs, tax revenues and technological advancement have now been scrapped. At the end of the day this was NOT government spending, but a repayable interest baring loan that had already fulfilled the Treasury's rigorous assessment criteria. Nuclear power is going to play an important part in Britains energy future, instead of investing in an £80 million loan in Britains own nuclear industry, Britain will now buy nuclear power plant components from abroad. Sorry but this has got to be your worst article ever. If they have such a red hot business proposition, why do they need the government as an underpin? Please do not let any local affinities cloud your judgement. Britain would not be the place it is today if billions of £'s had not been pissed away on trying to prop up British Leyland, coal mines and shipyards etc. If the UK is going to get itself out this mess, it will not be with the help of HMG crowding out entrepreneurs getting access to capital that can provide proper jobs. I look forward to your comments about how unfair it is for the under 16's to be deprived of free access to swimming pools or better still free laptops for kids who live on sink estates. New Nuclear power plants costing tens of billions will be built, its just not by brits but french, chinese, americans ? Free laptops is a great idea for those that live in sink estates. Better to be tapping away on laptops then engaged in petty crime, a % of which will go on to start businesses or a career in computing. Governments job should be to oil the economy in favour of the productive private sector, not fund a bankrupting public sector. The loan to forge masters that has been around since the industrial revolution started was LOW RISK. All business decisions are on the basis of risk vs reward, which in forge masters case the potential rewards far outweighed the risks. The decision was political because Sheffield is a Labour city so the cuts are being targetted at areas that will be least costly to the tories and liberal democrats in terms of voter fallout.